Staying within budget is difficult when planning the wedding of your dreams and the reception easily can eat up the majority of your funds. The good news is, you don't have to wipe out your bank account to have a beautiful wedding. 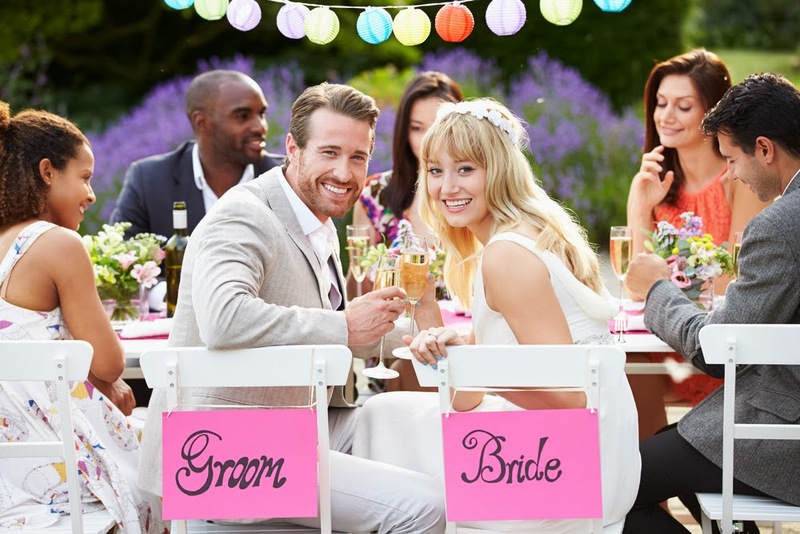 Here are some ideas you may not have thought of to help you save money on your reception! Using balloons for decor cuts down on the number of flowers you need to decorate the reception venue...and flowers can get expensive! You will still likely want SOME fresh flowers though. If you stick with those that are in-season, they will be less expensive. Have your hors d'oeuvres "hand carried" during the cocktail hour rather than set out on a table. People usually eat less when the food is being hand carried and served to them. It is easier to pile up your plate when no one is standing there judging and watching you take the food. Hand carried hors d'oeuvres actually look quite elegant! Your guests will think you spent a fortune on the "special treatment" at the reception. Use larger tables so that you don't need as many tablecloths. This will also cut down on the number of centerpieces and other table decor you need. You can save on decorations and favors when you shop the post-holiday sales. You can find modern black vases on sale after Halloween or pretty pink ones after Valentine's Day. Snowflakes are popular for winter weddings and can be found during the after Christmas sales. Instead of a full bar, offer beer, wine and maybe one signature cocktail. Consider choosing a venue that allows you to bring your own alcohol. Even if you have to pay a corkage fee, you can save quite a bit of money since venues typically have a significantly higher markup on liquor. 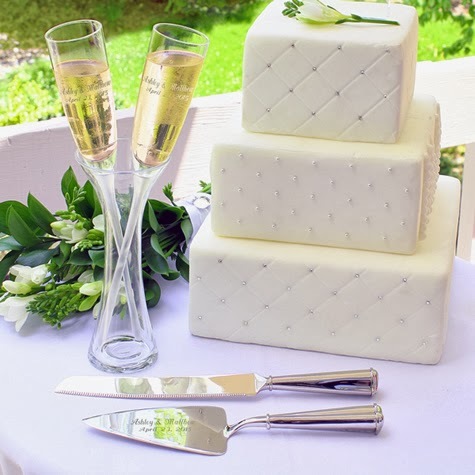 Instead of ordering a huge wedding cake that costs a small fortune, opt for a smaller one or two-tiered cake just for the cake cutting ceremony. The wedding party and immediate family is served this cake. Then have a less expensive sheet cake of the same flavor in the back for your guests. This enables you to have enough to feed everyone after the cake is cut without breaking the bank. Having your ceremony and wedding reception at the same place will save you time and money. You will have no need for transportation between venues, so you aren't paying for a limousine. Also, many churches and other ceremony venues have facilities equipped for handling receptions, usually at a more reasonable rate than other venue options (especially if you are a member). Before hiring a live professional musician, consider having your church pianist play at your wedding or perhaps you have a family or friend that sings beautifully. If not, look into the possibility hiring a school music group. This will cost a lot less than hiring a professional. For the reception, consider hiring a DJ to play your music rather than a live band; Some brides even have family members or friends in charge of the tunes at the reception. We caution you on this though ... especially if you are having a large wedding. Having a professional DJ/MC for the evening will ensure everything goes smoothly and on schedule. Don't be fooled by the perception that a buffet style meal is less expensive than a plated one. Sometimes vendors charge more for a buffet because they are making more food. Be sure to get quotes from your caterer on both types of meals (buffet or plated) before making a decision. Serving a duet instead of having choices for your guests can also reduce the cost of the plated meals as the caterer can serve smaller portions and order the same amount of everything. Also, consider doing just heavy appetizers and dessert as opposed to a full meal. 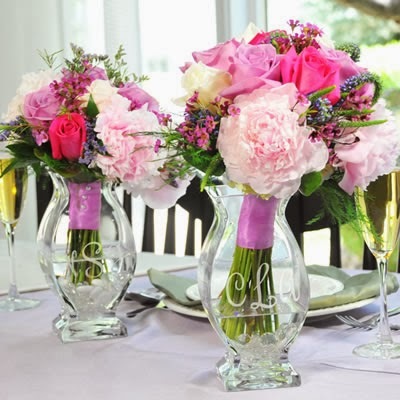 If you (or someone in your family) is crafty, consider the DIY approach to wedding favors and decor. 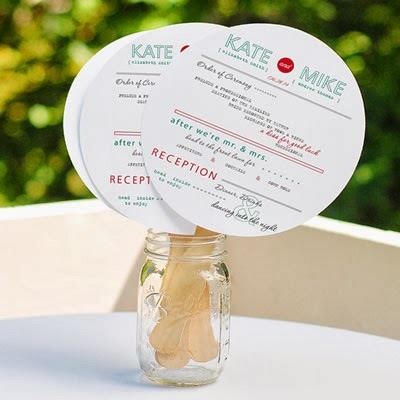 Rather than purchasing pre-packed wedding favors (which can run $3-$5 each), you can purchase empty wedding favor containers and fill/decorate them yourself. These typically run around 50 cents each, so the savings add up quickly! The key to saving money on your reception is to consider all your options. Don't just jump on the first idea you have because it sounds good. Do your research and make an informed decision on everything. There may be some things you aren't willing to part with like the live band or the gorgeous giant wedding cake ... decide which areas you want to splurge on, then try to save in other areas to make up for that. Sit down a prioritize everything on you list, decide what is most important to you and your fiance and then go from there. Remember saving money on your wedding means that you won't come back from your honeymoon in a boatload of debt ... and THAT is a great way to start a marriage!